This is a unique silkscreen and mixed media on paper; inscribed with an archive number on verso. This work is hand signed by Mr. Brainwash (Garges-lès-Gonesse 1966 -) in ink in the middle left. 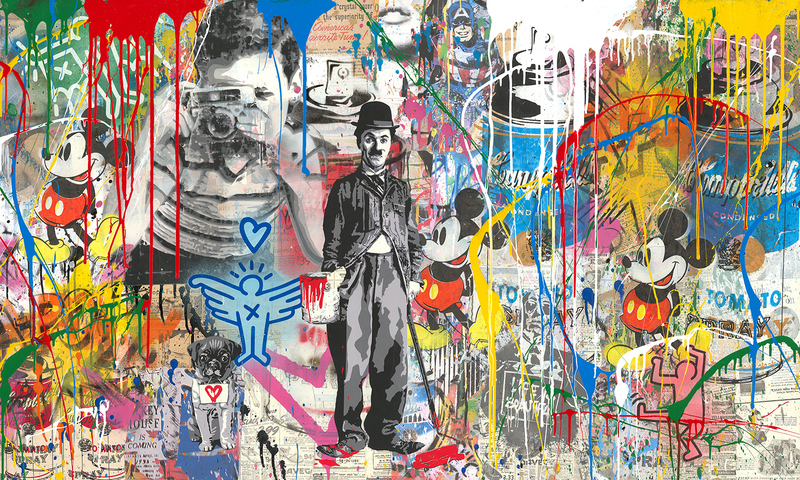 Mr. Brainwash Mixed Wall, 2019 is an animated and colorful work featuring Charlie Chaplin, a worldwide icon and important figure in the history of film. Chaplin, the central figure in the piece, is executed in the signature style of Banksy, a pioneer in the graffiti art scene who greatly influenced Mr. Brainwash. Clad in his famous Little Tramp attire, Chaplin holds a can of red paint that drips onto his shoe, playfully suggesting his involvement in the execution of the work and, in Mr. Brainwash’s controversial style, fusing historic, modern and contemporary culture. Several other partially hidden figures throughout the pictorial plane are also reminiscent of Banksy and his black-and-white style, such as the dog in the lower left and the boy above it, whom Mr. Brainwash humorously portrays as though taking a picture of the viewer. 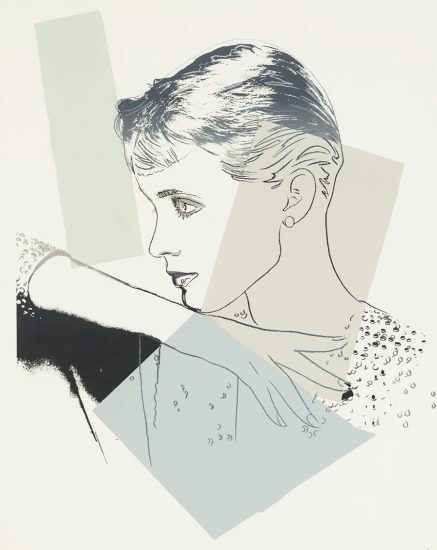 Reminiscent of a collage, the work incorporates images from several artists that pioneered the pop-art movement, including Andy Warhol, Keith Haring and Roy Lichtenstein. 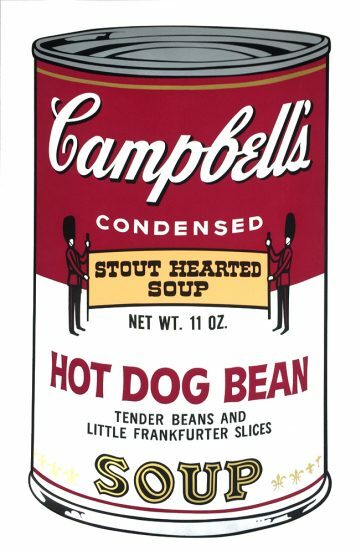 Campbell’s soup cans and Mickey Mouse figures, some of the most well-known imagery in Warhol’s work, dance alongside energetic cartoon-like figures reimagined from Haring. 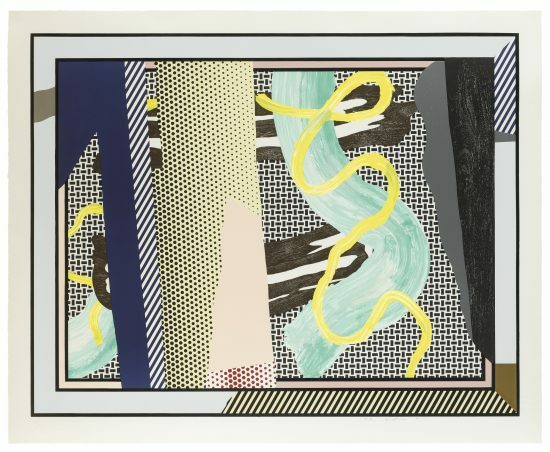 Lichtenstein’s celebrated capitalized words are also tucked into the riot of images and colors. 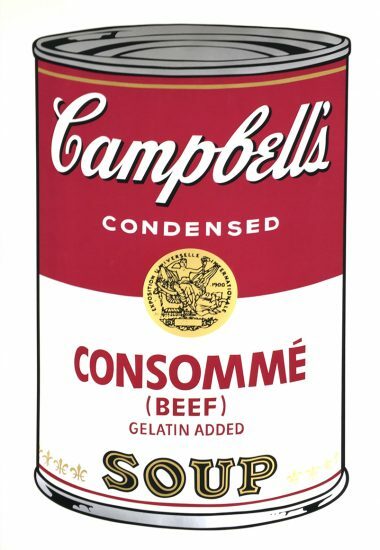 Like on a graffiti-inspired wall, Warhol’s Campbells cans morph into spray paint cans, merging modern and contemporary art. Splatters of red, blue, green, yellow, pink and white drip down the surface creating an intriguing dialogue between graffiti art, pop-culture and historic icons. This juxtaposition of emblems of society makes a commentary on the past and the present, a celebrated theme for which the controversial and eccentric Mr. Brainwash is known. Created in 2019, this work is hand signed by Mr. Brainwash (Garges-lès-Gonesse 1966 -) in ink in the middle right. 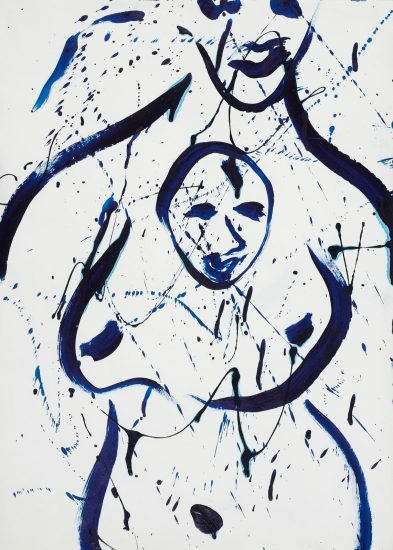 This is a unique and original silkscreen and mixed media on paper. Mr. Brainwash Mixed Wall, 2018 is fully documented and referenced in the below catalogue raisonnés and texts (copies will be enclosed as added documentation with the invoices that will accompany the sale of the work). Framed to museum-grade, conservation standards Mr. Brainwash Mixed Wall, 2018 is presented in a complementary moulding and finished with silk-wrapped mats and optical grade Plexiglas. 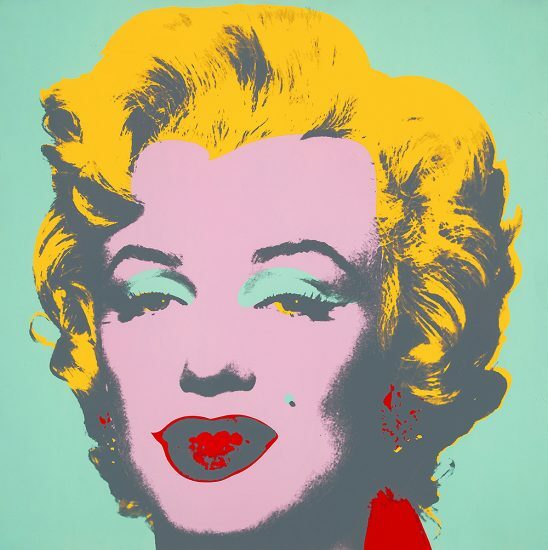 Mr. Brainwash explores the intersection of pop art and graffiti art to make social commentary. Colorful, fun, and meaningful, the works are an excellent addition to any collection. 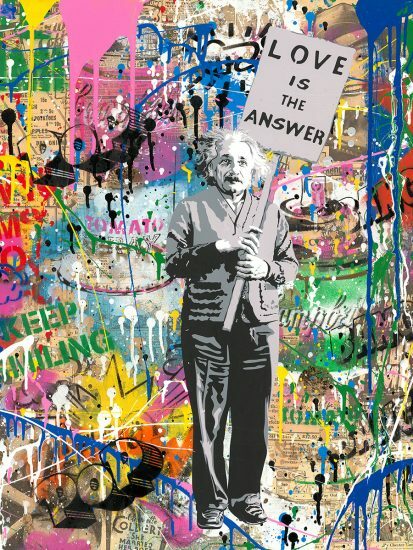 Sell your Mr. Brainwash fine art with us. We offer free evaluations.